Hey there my lovely divas? How are you? Are you enjoying the beautiful time spent with your family? I’m always here to show you the latest fashion trends and inspire you to follow them. Knit scarves are totally in and today I will show you how to style them! Scarves are one of the must-have winter accessories. You can find them in so many versatile colors, styles and designs, and that’s why you can never have enough of them. However, the knit ones are one of the warmest pieces and you should make them your best friends. From white to beige, green and pink, you can find this type of scarves in almost any color you want and update your winter outfits. You can choose a color that will match with the most of your outfits, or maybe get some scarves in some vibrant and bold colors and and thus make it pop out from the rest of your winter combos. 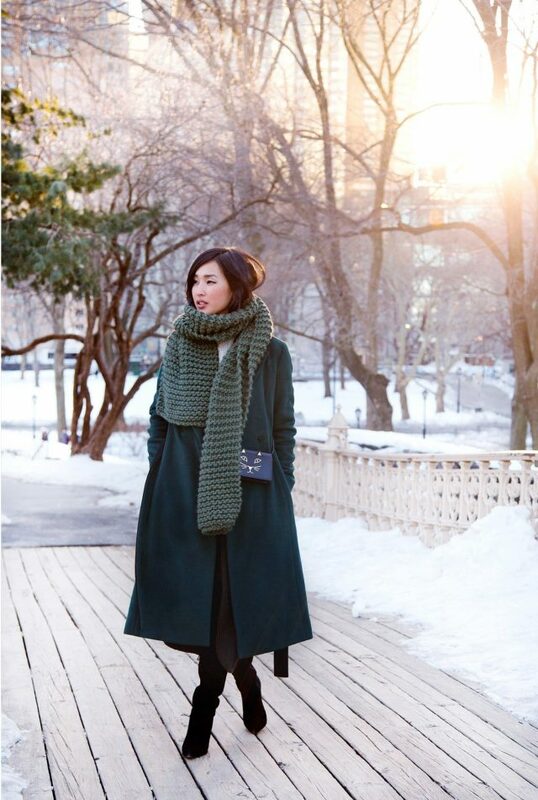 Knit scarf designs can make a statement with their cozy and soft texture. And if you choose them to be in some contrasting color, they can make even a bigger statement. You can math your warm knit scarf with almost any type of coat, except for fur ones. They also look great with leather jackets, so you can spice up your leather jacket with a knit scarf for the not so cold days. You can choose to wear the same color of jacket and scarf. For more interesting look, choose different shades. Fashion bloggers choose to wear darker jackets or coats and scarves in lighter colors. But that doesn’t mean that you can’t do the other way round. So, what do you think about these outfits my dear people? Do you fancy wearing knit clothes and do you find these knit scarves beautiful and warm? Which outfit do you like the most and would you like to wear this season? I would love to know your opinion, so please feel free to share your comments with me! If you already have worn some chic outfits with warm knit scarf designs, please share them with me – I would love to see them. Thank you for reading! Enjoy in the rest of your day and don’t forget to stay up to date with the content of Fashion Diva Design!